← Disgusting Discovery! Mystery Solved? Note: We are behind on our blogging, mostly due to projects in progress on our house, so please bear with us as we endeavor to catch up. 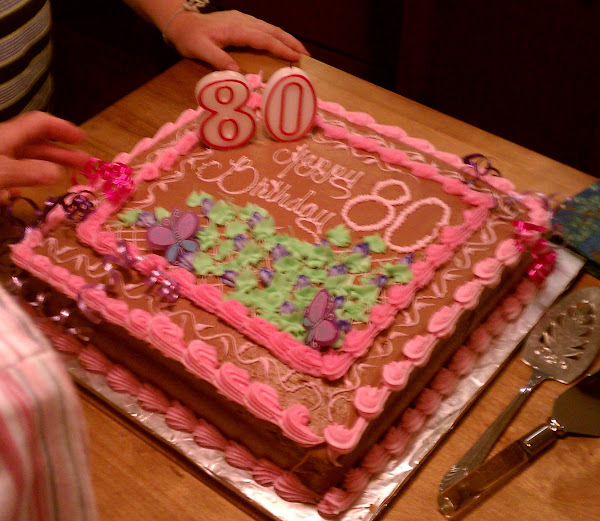 On June 30th, a member of our family reached a major milestone – Rob’s Mom, Jo, turned 80! Rob’s Dad decided that a family birthday party was in order since Jo had never had a birthday party. Imagine that! So after scouting around, looking a various restaurants and halls, they decided the best place for a party was at their favorite restaurant, Twin Oaks in Cranston, RI. So at 4:00 pm on Saturday afternoon June 30th, all 21 members of the immediate family assembled at the restaurant where we had a semi-private room which was large enough to hold about 30 people. Rob’s brother, Jeff, his wife, Michelle and their three children, Olivia (14), Sienna (14) and Christopher (8) had driven in from Chicago. His other brother, David and his wife, Nancy, daughter, Katie (18) and son, Jonathan were here from Albany, N.Y. Local family members included Rob’s aunt and uncle, Linda & Herb, his two cousins, Greg and his wife, Erica and their son, Noah (5), and Cindy plus his uncle Joseph and his wife, Dottie. You can’t beat the food quality and portions at Twin Oaks and as expected we all had great meals and most of us took leftovers with us. Afterwards we all went back to Mom & Dad’s house for coffee, cake and more good times. Here’s a shot of the entire group on the front steps – it took 15 minutes to get this shot – a “multi-producer production” that probably would have made a very hilarious reality TV show episode! In the photo, Mom is the fourth from the right in the top row, Dad is the sixth from the right. At the restaurant each table had a copy of the following “fact sheet” composed by Dad. Today is Saturday, June 30, 2012, The 80th birthday of my DEAR WIFE, JO!! Welcome to Jo’s 80th birthday get-together. Thanks for coming to share this occasion with us! To this date, this is how long Jo has been with us!! In case you weren’t aware of it, look around you and see YOUR IMMEDIATE FAMILY!! Yup, all 21 of us! As far as I can determine THIS IS US! GLAD WE COULD GET TOGETHER! We would also add that Mom (Jo) during her 80 years has traveled 46,640,000,000 miles – astronomically that is! The earth travels about 583 million miles around the sun each year! Wow on the b/d cake. Sure wish I had a piece of it. Yummy. Great picture of the entire family. Being a twin, I immediately picked out the twins. Put a smile on my face. I loved the whole commentary. Good job.